Natal lily (Clivia miniata): growing, planting, caring. An exotic houseplant with long-lasting flowers. Clivia - Natal lily or bush lily - is a genus of monocot flowering plants in the family Amaryllidaceae native to southern Africa. They are herbaceous evergreen plants, with green, strap-like leaves and more or less bell-shaped yellow, orange to red flowers in umbels on a stalk above the foliage. Many cultivars are sold as houseplants, some with variegated leaves. Flowering time varies according to the species. Typically C. miniata, C. nobilis and C. caulescens flower in late winter and spring - in cultivation, C. miniata has out of season flowers at almost any time. C. gardenii and C. robusta flower in the autumn. Interspecific hybrids and cultivars can flower at almost any time of the year depending on climate and the flowering pattern of their parent species. Clivia is an evergreen perennial with an umbel of large, often orange bell flowers at the top of a thick stem. The leaves are long, waxy, fan-shaped. 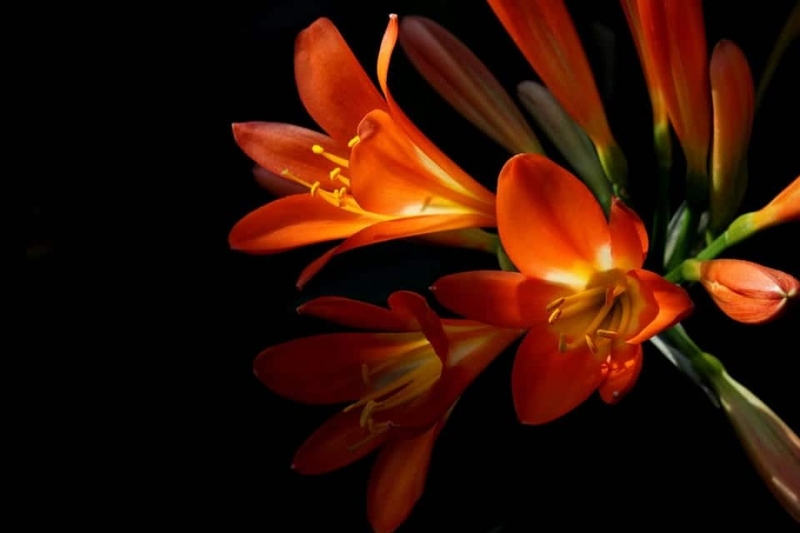 South African plant, your clivia will flourish around 20 ° C all year except in winter, sheltered from the direct sun, in a pierced pot filled with a mixture of peat, compost and sand, or pearlite. Put the sand at the bottom of the pot, to facilitate draining, because your clivia will not appreciate having its roots wet. Clivia does not like excess moisture, however keep the substrate moist during spring and summer. In autumn and winter, the plant is at rest, so wait until the soil is dry between waterings. Avoid using hard water, and spray foliage regularly. Watch for mealybugs. If you see some, remove them with a cotton swab soaked in alcohol.